Windows can be tricked out a lot by hacking the Registry, but it’s not something a beginner should be playing with. here’s how to disable user access to it. Windows can be tricked out a lot by hacking the Registry, but it’s not something a beginner should be playing with. In fact, if you don’t know what you’re doing, you can really screw up your computer. Whenever we write about something cool you can do with Windows by making a Registry tweak, we always tell you to back it up first. That way if something does go awry, you can restore it back to its original working state. But maybe you would rather not have to worry about anyone in your house or the office messing with it at all to save the headache. 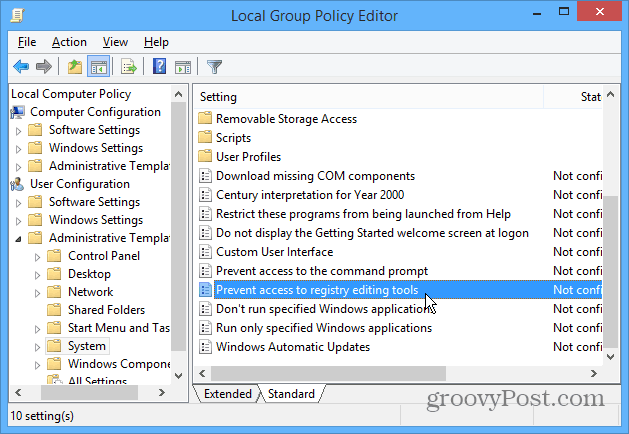 Here’s a look at how to do it in Windows using Group Policy Editor. Note: You will need to be Administrator to enable this setting. If you have a shared computer, and don’t want other users on your PC making Registry changes (or installing software), set their account up as a Standard User. Also note that Local Group Policy Editor is not available in Home versions of Windows. Start by opening Local Group Policy Editor. In Windows 7 click Start and type: gpedit.msc and hit Enter. 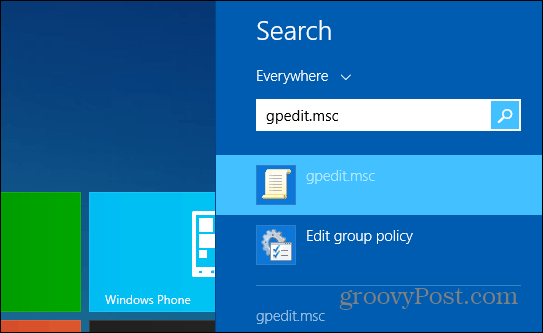 In Windows 8.1 you can simply type gpedit.msc from the Start screen. Then navigate to User Configuration > Administrative Templates > System. Then double-click on “Prevent access to registry editing tools” on the right under Setting. 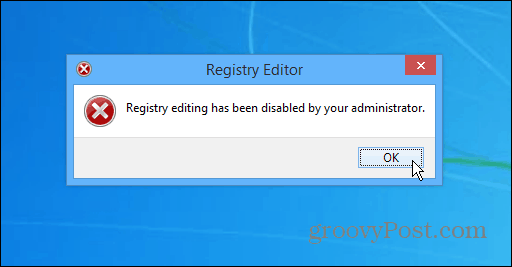 Now change the setting to Enabled, click OK and close out of Group Policy Editor. After that if a user tries to access the system’s registry for any reason, they will get the following message letting them know access is denied. This is a helpful setting if you want to allow other users to have Admin privileges, but don’t want to take the risk of something going wrong if they try poking around in the Registry. For those that have Win 7 Home or Vista (!) 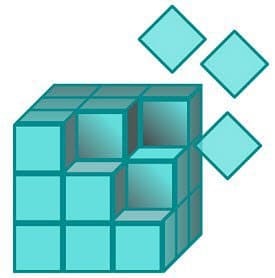 here’s a handy link that will guide you through the steps in disabling/re- enabling regedit (http://www.vistax64.com/tutorials/116415-regedit-enable-disable.html). As with anything to do with the registry think hard and long before making changes and, as Brian stated, “… back it up first. That way if something does go awry, you can restore it back to its original working state”. Mucking around with the registry (unless you know what you’re doing) is akin to dancing with your worst nightmares in an ice tub. That is a colorful way of stating it! nice.